Srinagar, March 22: Six militants and a 12-year-old boy were killed on Friday in three separate gunfights in Jammu and Kashmir, police said. Two militants and a the boy, who was taken hostage, were killed in an encounter in Bandipora district's Mir Mohalla area. "One Lashkar-e-Taiba (LeT) commander is among the two militant victims," the police said. In Shopian district's Imam Sahib area, the security forces killed two militants following a gunfight. In another gun battle in Sopore's Warpora area, two militants were killed in the same site of an encounter on Thursday where two policemen were injured. The police said the gunfight in Bandipora has ended but the two others were still going on. Jammu And Kashmir: One Terrorist Killed In Encounter At Bandipora. All educational institutions in Sopore were closed and mobile Internet services suspended as a precautionary measure. 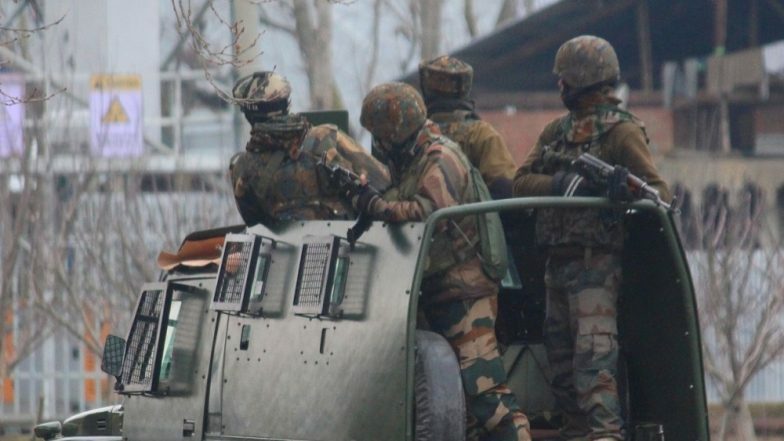 On Thursday, three militants were killed while seven security men and three civilians injured in three different gun battles in the Kashmir Valley.